Where have I been? You ask. Why haven’t I been cooking up tasty rhubarb pies and crisps and cakes and making asparagus quiche for dinner and loving every single springtime morel mushroom I can get my hands on?! You ask. Well, I actually have been doing some of these things. I just haven’t been telling you about it. I’m so sorry. Please forgive me. Part of this general lack of telling has to do with the fact that I dropped my sweet little trusty reliable laptop love of the past 4 years onto the floor and it will not recover. Ever. And I’m daunted by the task of buying a new one. So there’s that. But that’s really only a very small part of what’s going on. 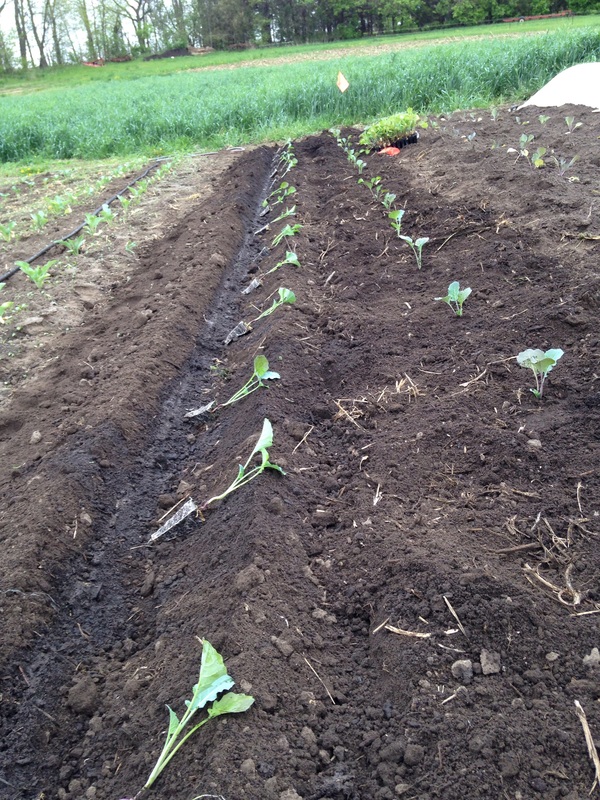 The much larger part of the equation is that it’s May on the farm and we have been transplanting our little hearts out! No, not literally. Our hearts are still intact. No bodily transplanting taking place. Only the transplanting of hundreds and hundreds of happy plant babies into adequately watered and composted trenches of soil. Oh, you all aren’t farmers? You don’t know what the hell I’m talking about? Let me explain. In pictures! Step 1: Look at all the pretty plants you have raised since March in your greenhouse (or in your friend’s greenhouse). 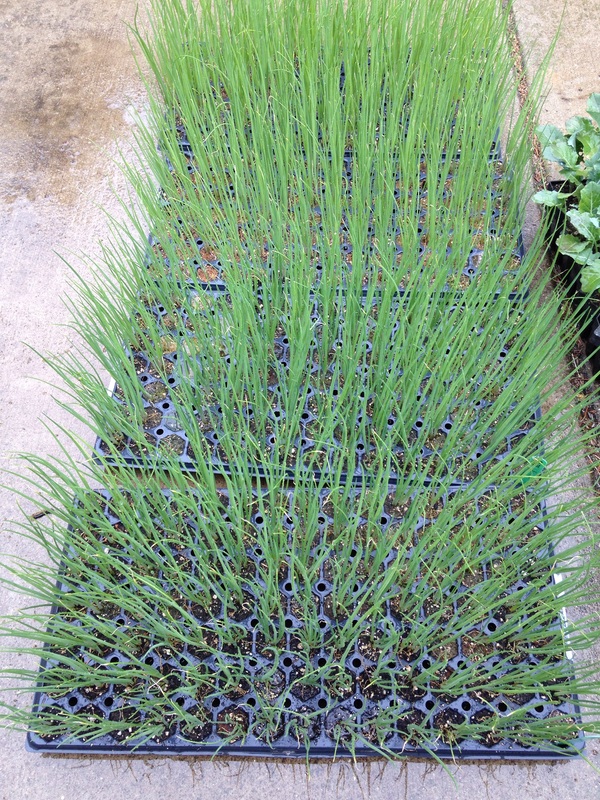 Hint: These are scallions ready to be transplanted. Step 2: Scoop compost into buckets and dump these buckets out in a line (the exact, measured-out line where the little planties will soon be planted). Feel really lucky on the days your brother decides to help. Those buckets are heavy heavy! Step 3: Till the compost into the soil. Step 4: Make a trench with the wheel hoe in an exact, measured-out and hopefully straight line. (Picture coming soon). 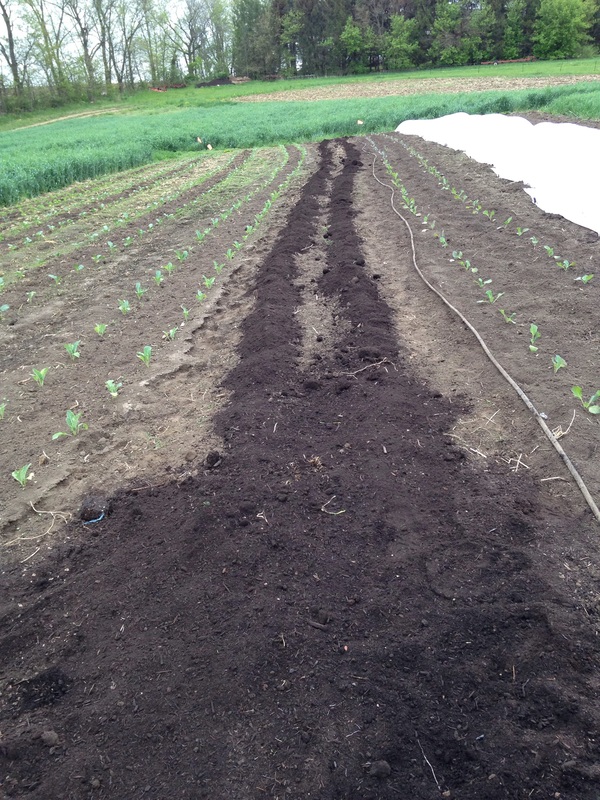 Step 5: Lay the soaker hose in the trench and let it run for a couple minutes so the soil is nice and wet. 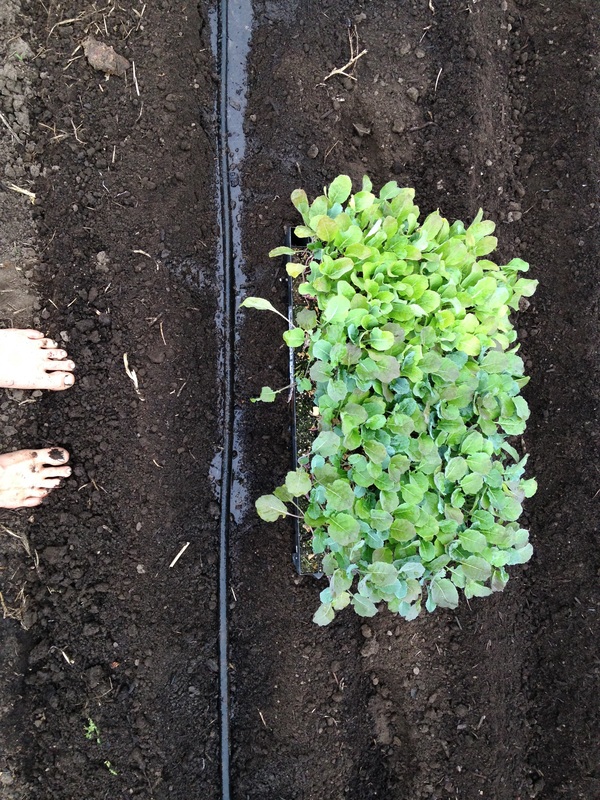 Transplants like to go into wet ground. It helps their roots get established and keeps them adequately watered if it decides to be a dry spring (like this year) and sometimes not rain for a week. Ignore how white your feet are. It’s only May for goodness sake! 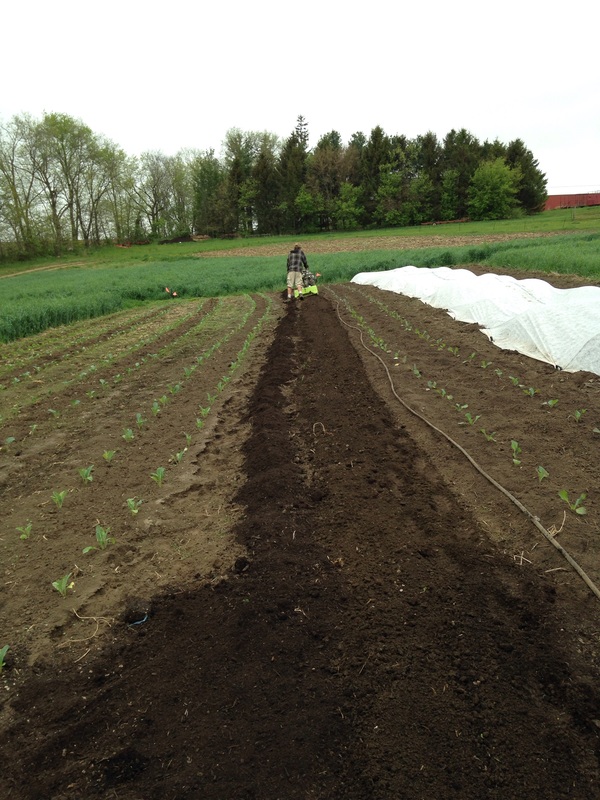 Step 6: Move the soaker hose to the next furrow. 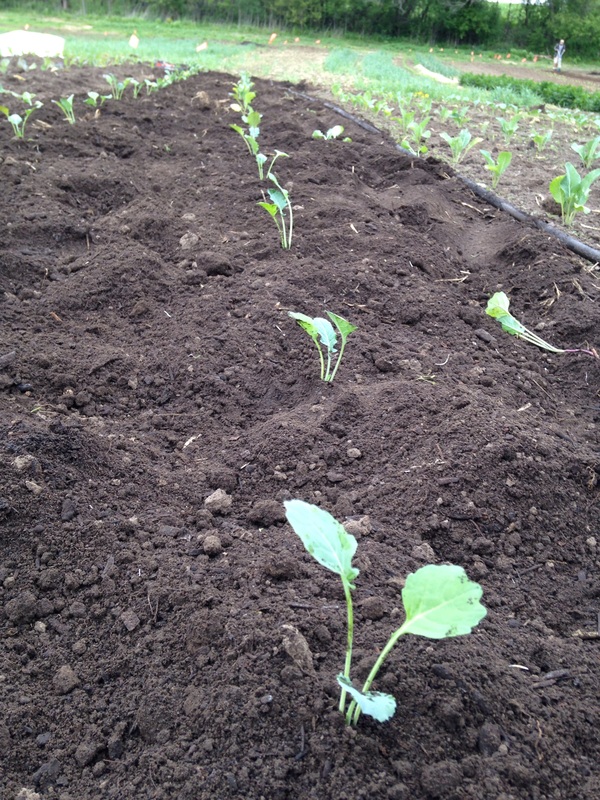 Lay out the little plant babies into the watered trench. Hint: these are Brussel Sprout babies!!!! Step 7: Make sure you have appropriate spacing! Here it’s 18 inches or exactly 1/2 of an orange flag. See the sophisticated measurement system?! Step 8: Put the happy little plants into the soil and fill in the trench around them with soil so they are all tucked in. Gently push down the soil around the plant. 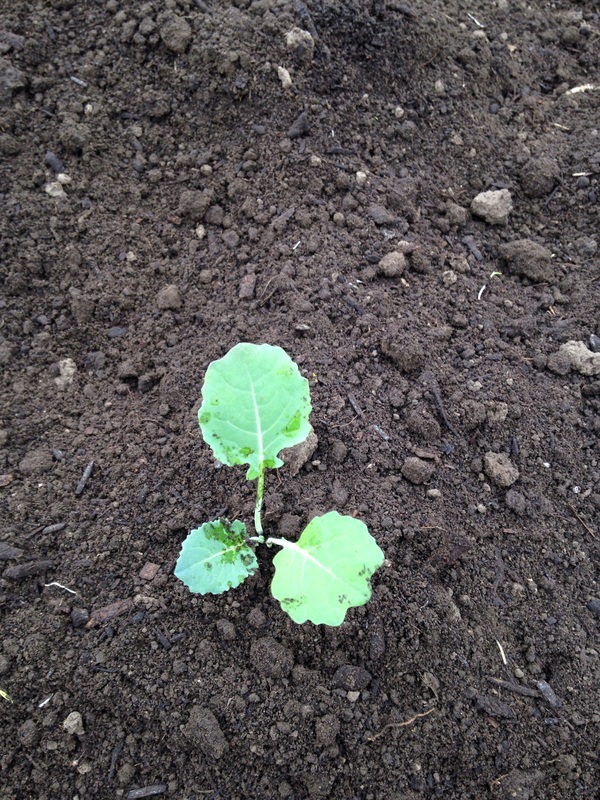 Hint: This is a very very happy broccoli plant. Step 9: Repeat with the second row (if your bed happens to have two rows). 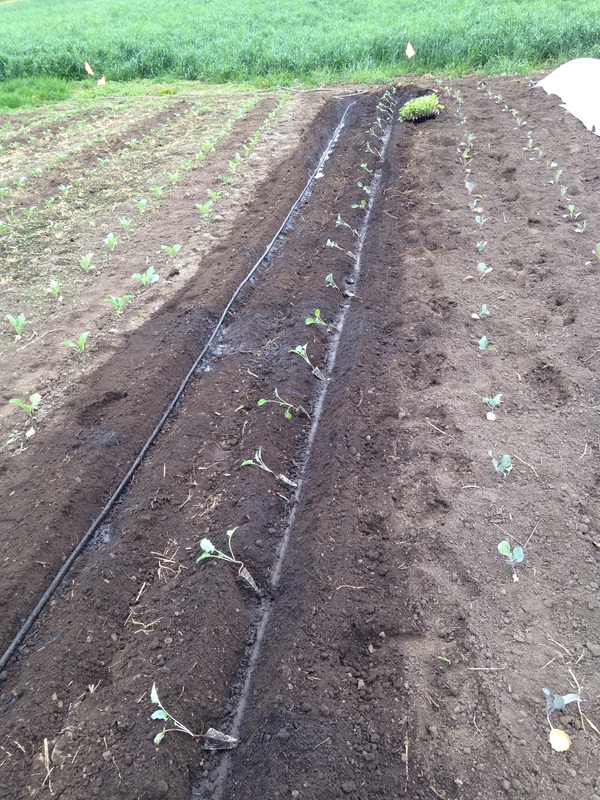 Hopefully you remembered to shut off the soaker hose so the trench is not in fact… soaked. Step 10: Look at your happy little newly planted seedlings and wish them luck on their season of feeding 50 happy families!!! (Ignore that little seedling off to the side. He has been thinned. More on this later). 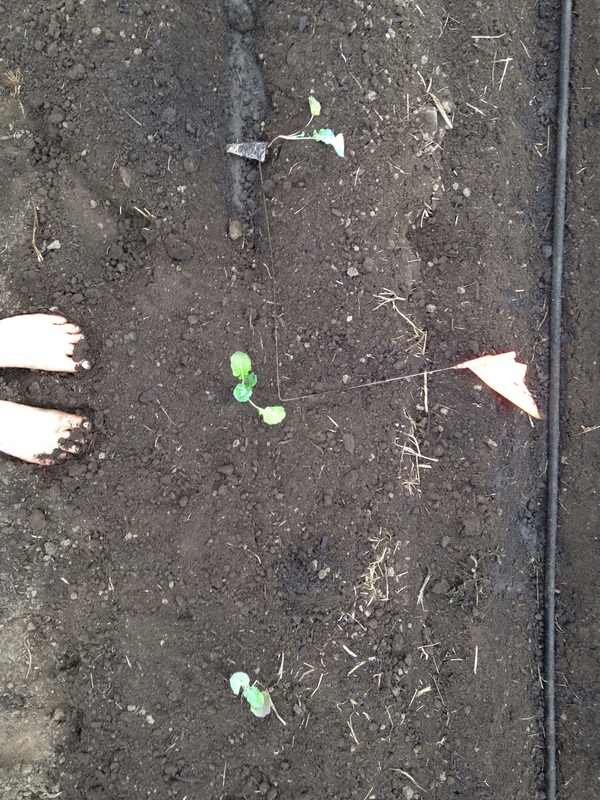 Step 11: Sometimes cover the plant babies with row cover so that they are protected from mean flea beetles or cold frosts or just so they can get a jump start on their growing. Step 12: Eattttttt! 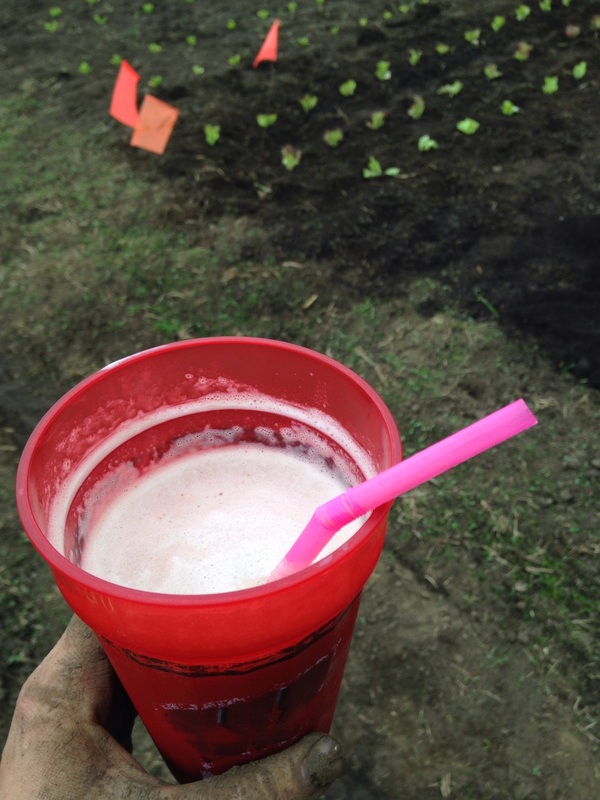 Because transplanting is a lot of work! Thanks for all the milkshake and sandwich deliveries little bro!! 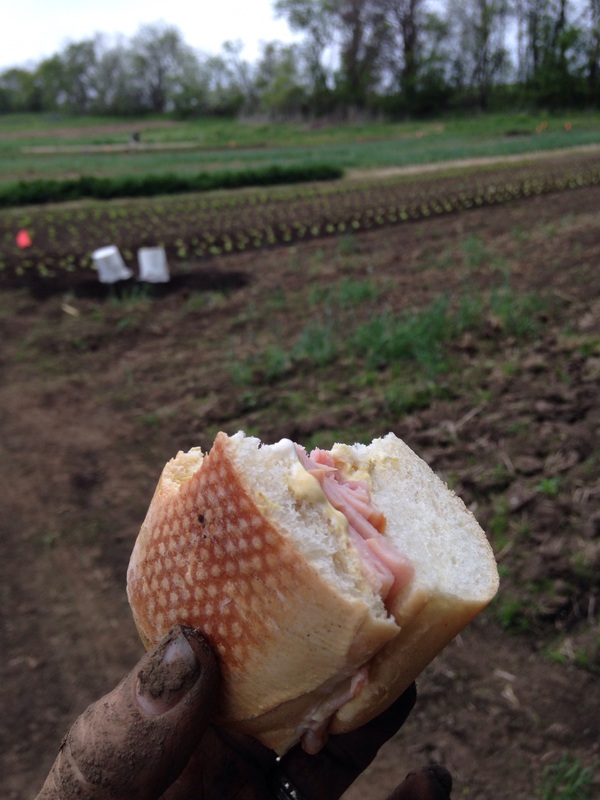 I’ll never tire of eating in the field with dirty hands. Makes me feel like a kid again! Hope you all get to get out in the fields and help a farmer this spring. There’s nothing better (and crazier) than May on the farm.